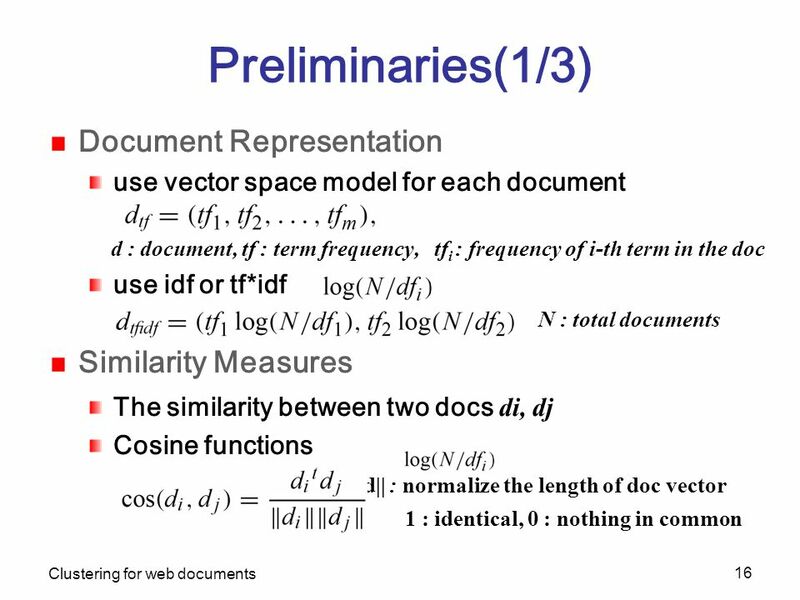 Clustering for web documents 1 박흠. 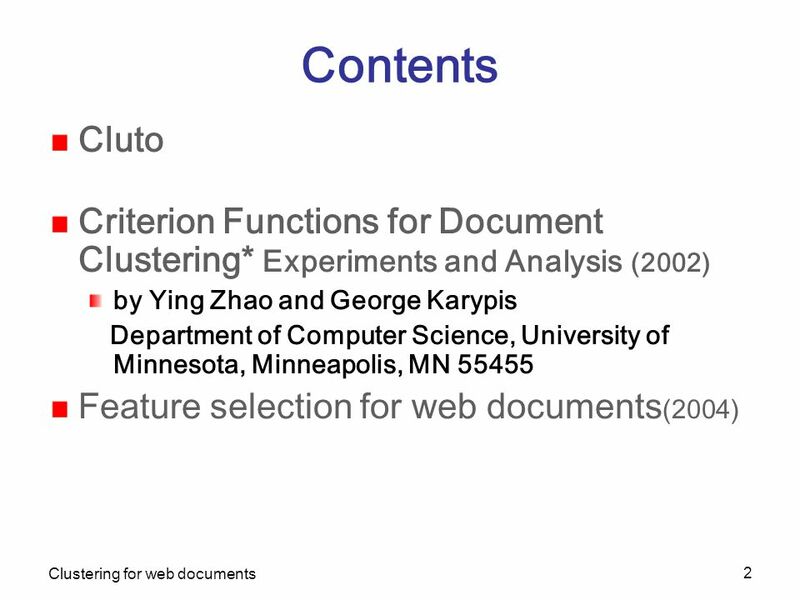 Clustering for web documents 2 Contents Cluto Criterion Functions for Document Clustering* Experiments and Analysis. 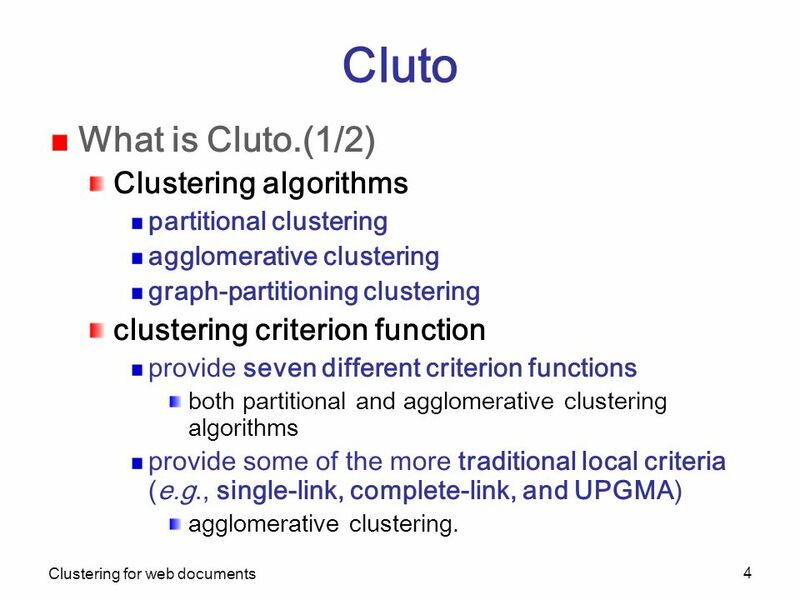 4 Clustering for web documents 4 Cluto What is Cluto. 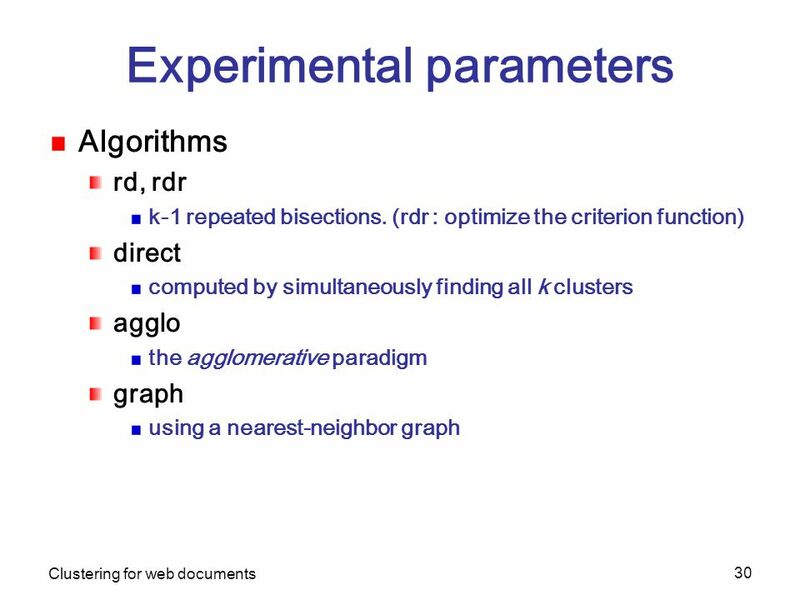 (1/2) Clustering algorithms partitional clustering agglomerative clustering graph-partitioning clustering clustering criterion function provide seven different criterion functions both partitional and agglomerative clustering algorithms provide some of the more traditional local criteria (e.g., single-link, complete-link, and UPGMA) agglomerative clustering. 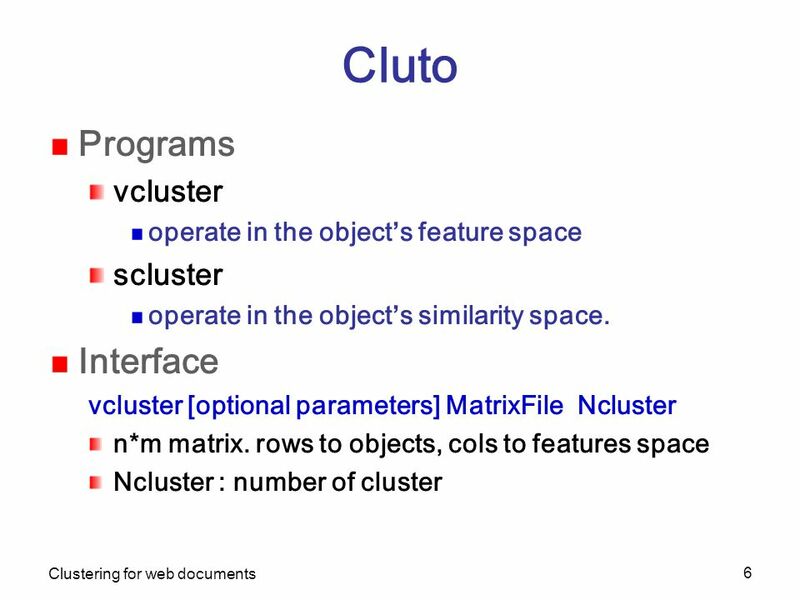 5 Clustering for web documents 5 Cluto What is Cluto. 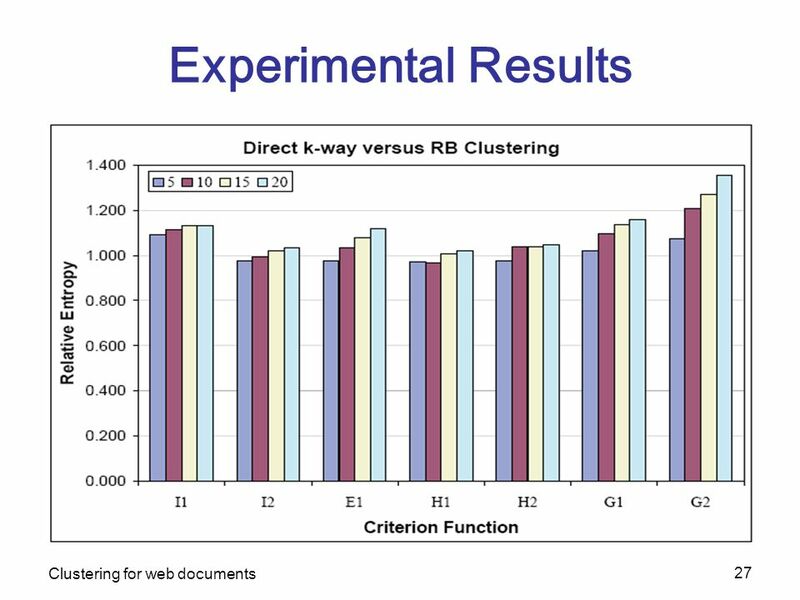 (2/2) Analyze discovered clusters relations between the objects assigned to each cluster relations between the different clusters identify the features that best describe and/or discriminate each cluster. 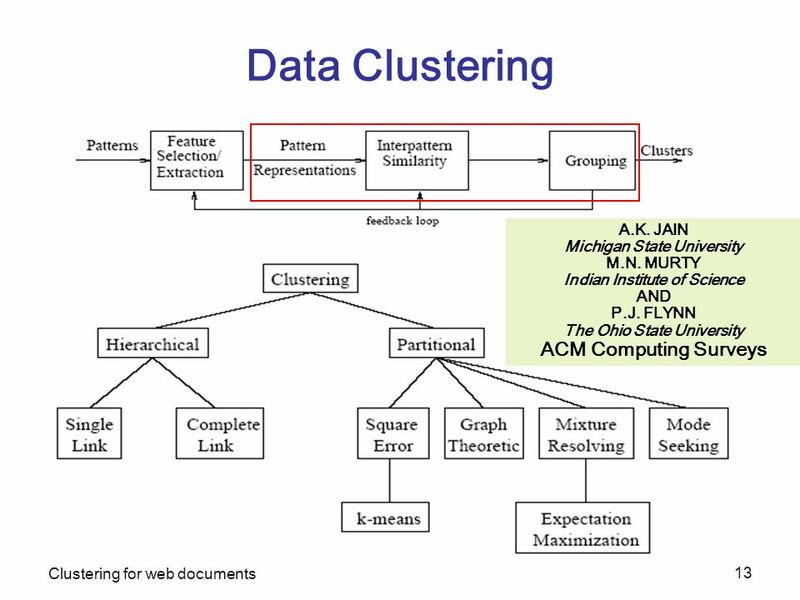 relationships between the clusters, objects, and features. 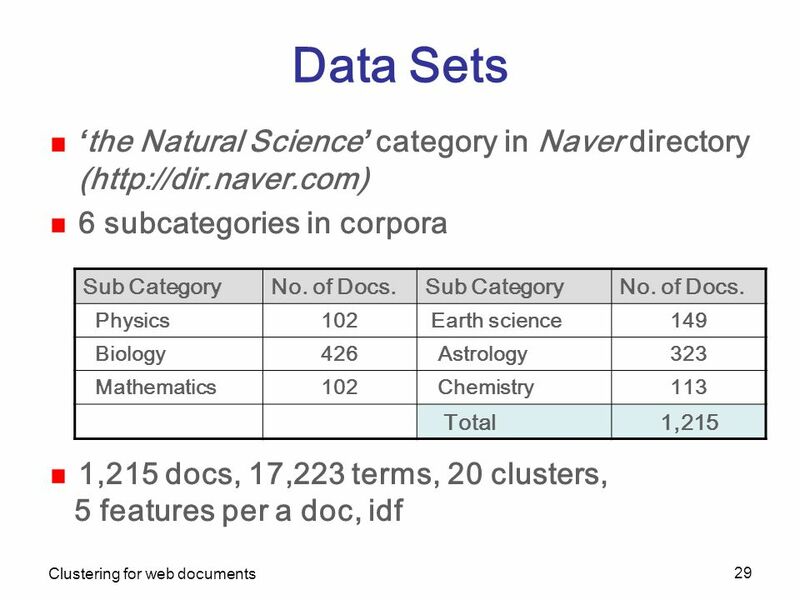 operate on very large datasets the number of objects the number of dimensions. 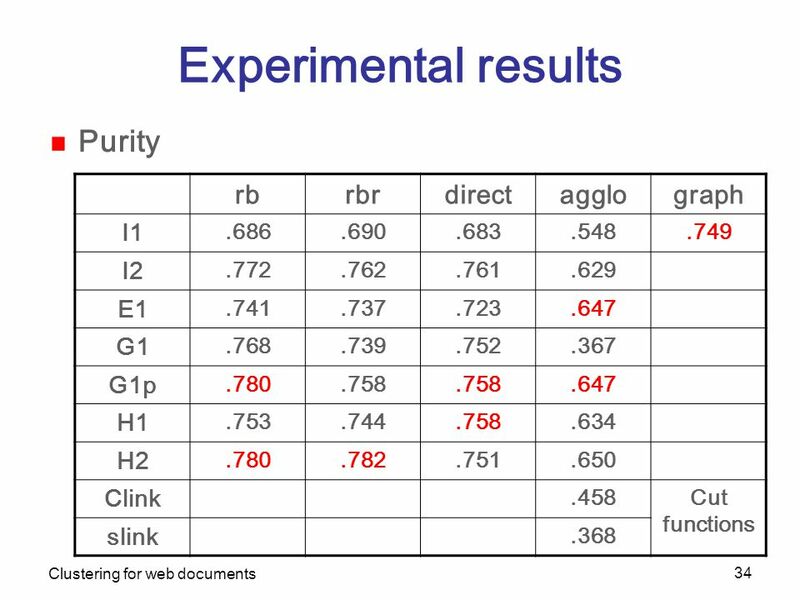 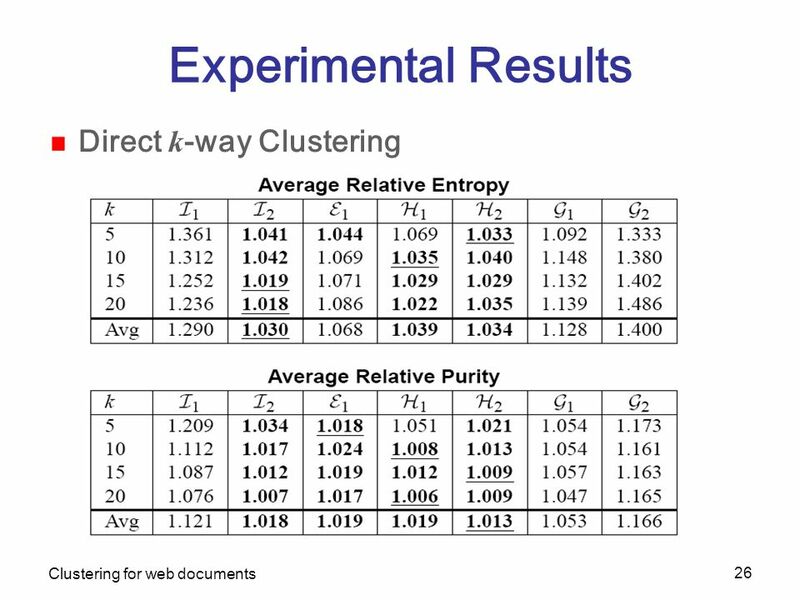 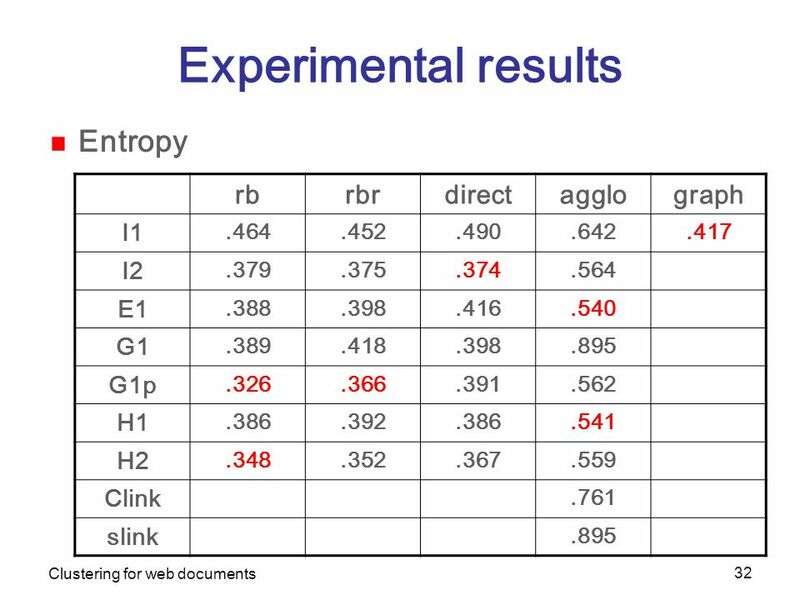 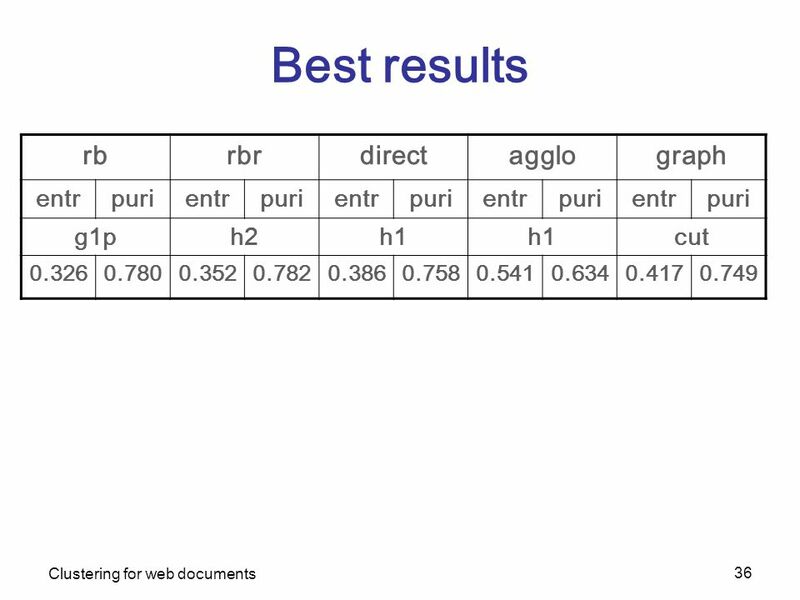 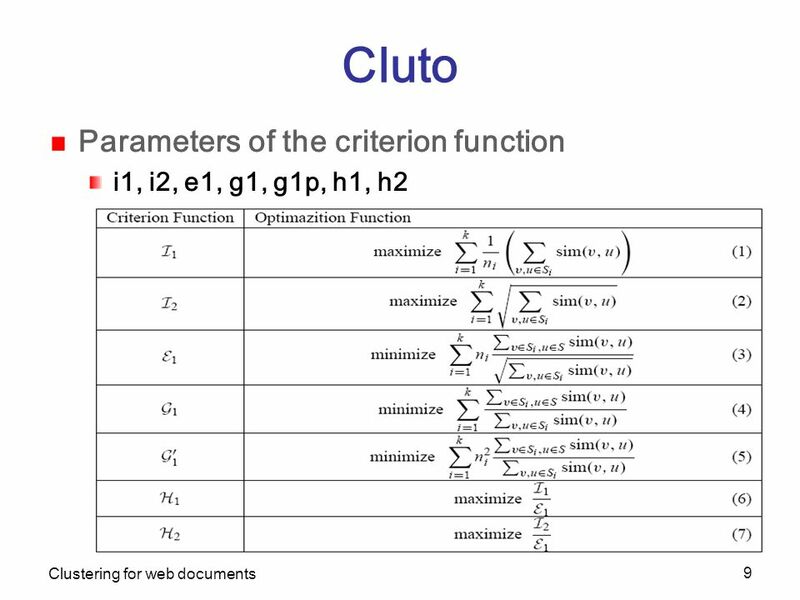 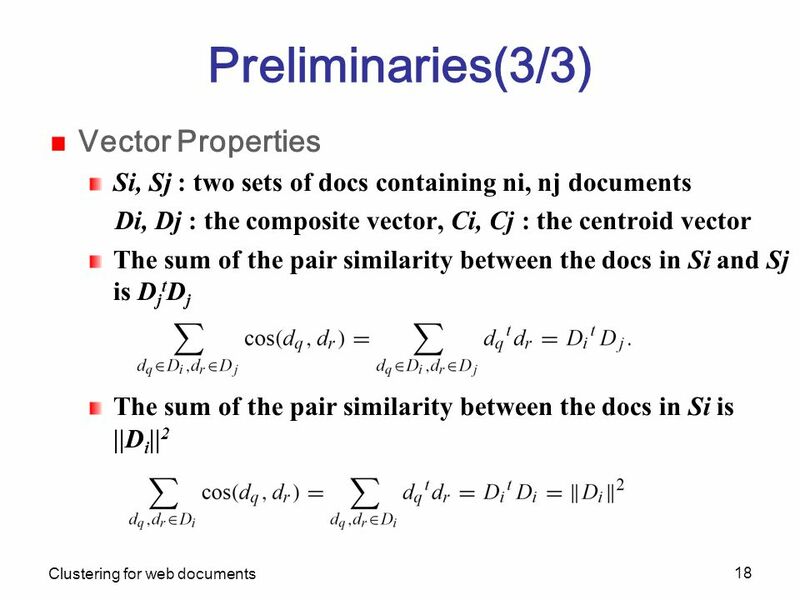 8 Clustering for web documents 8 Cluto Parameters of the similarity function cos the cosine function. 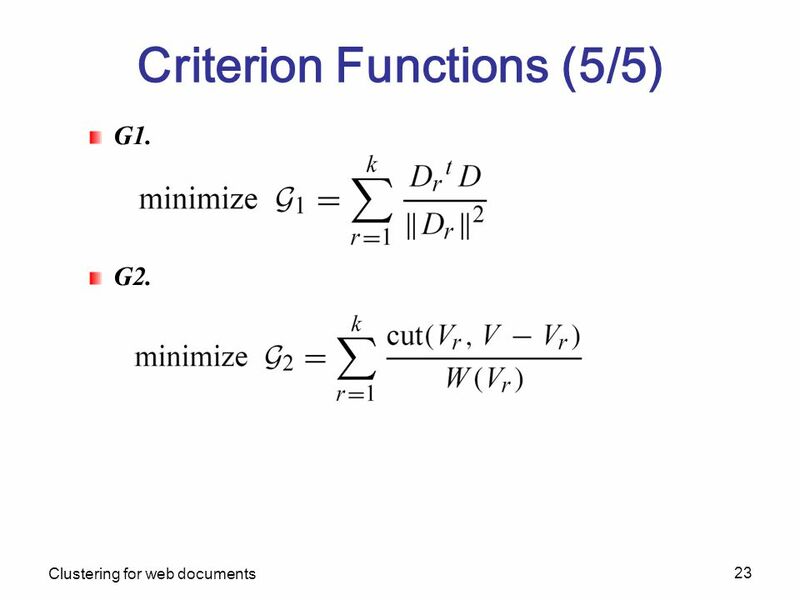 default. 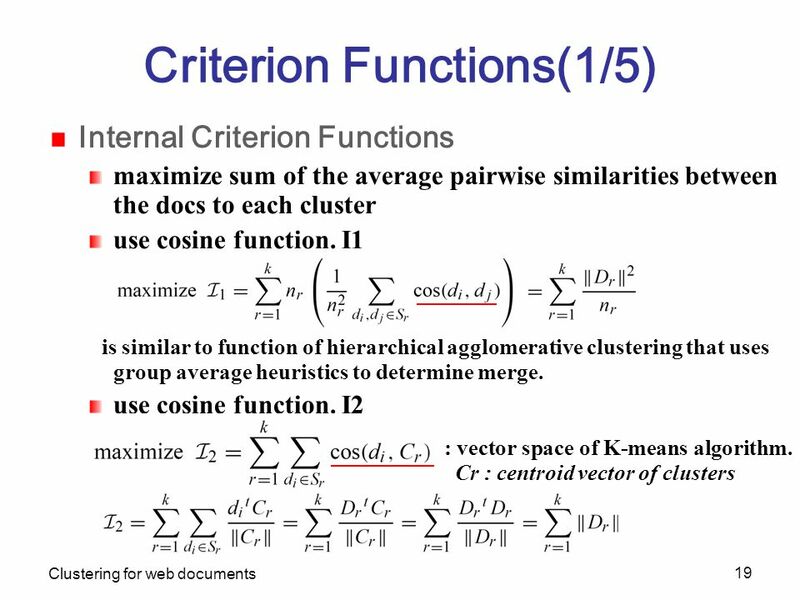 corr the correlation coefficient. 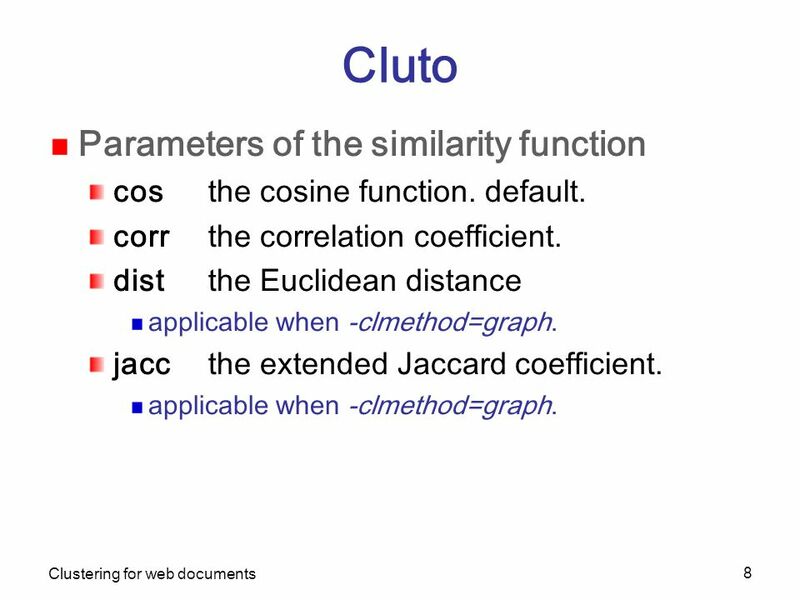 dist the Euclidean distance applicable when -clmethod=graph. 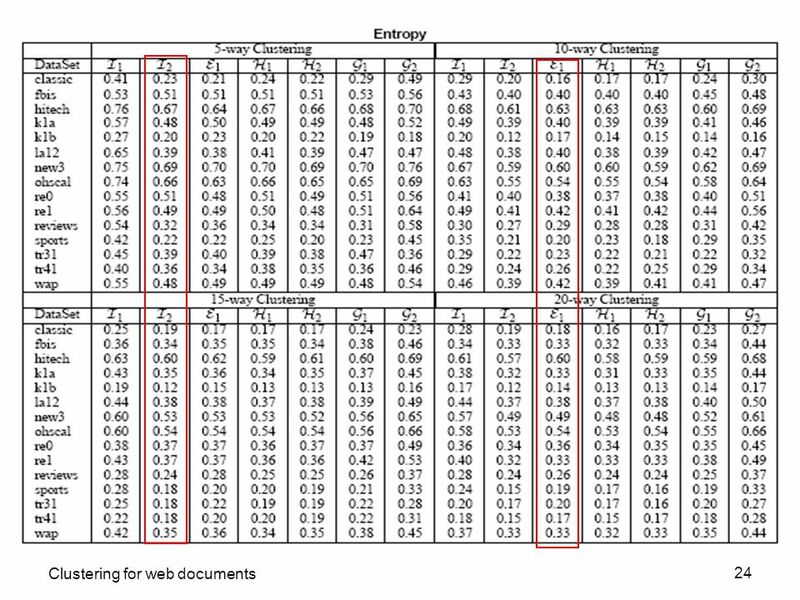 jacc the extended Jaccard coefficient. 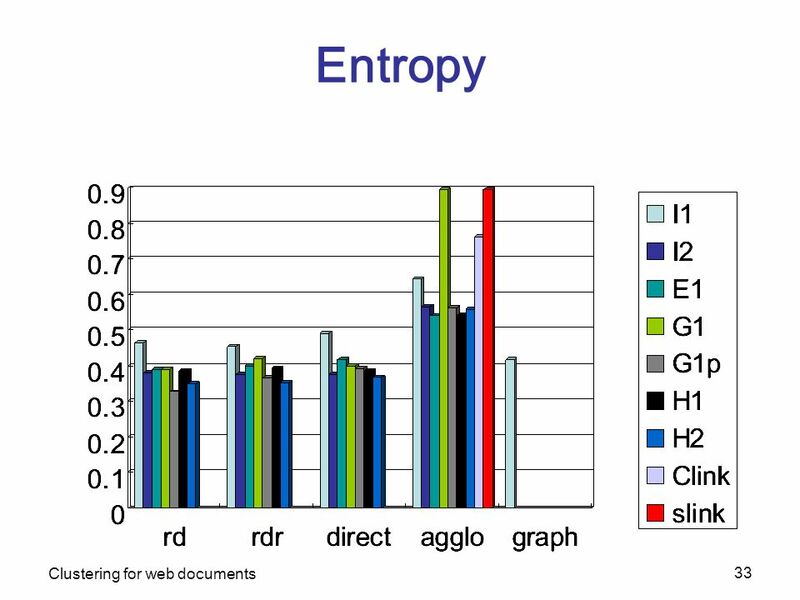 applicable when -clmethod=graph. 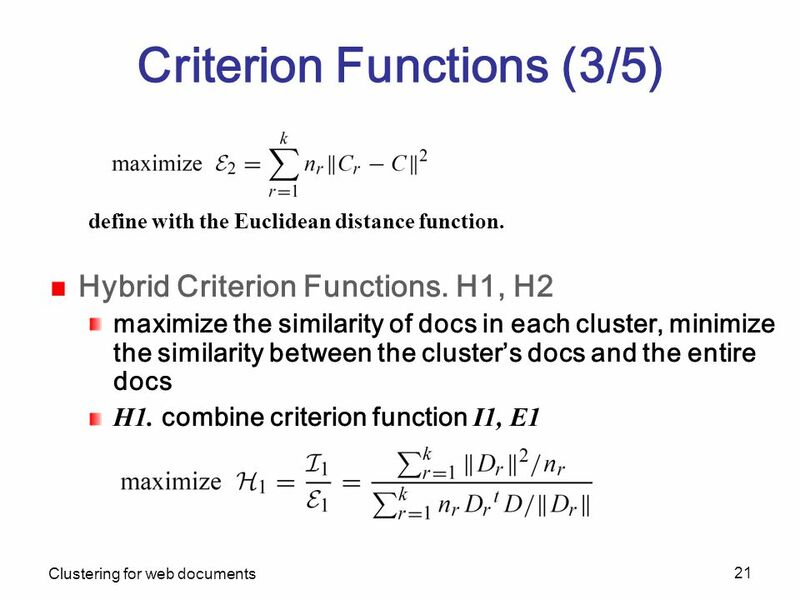 20 Clustering for web documents 20 Criterion Functions (2/5) External Criterion Functions. 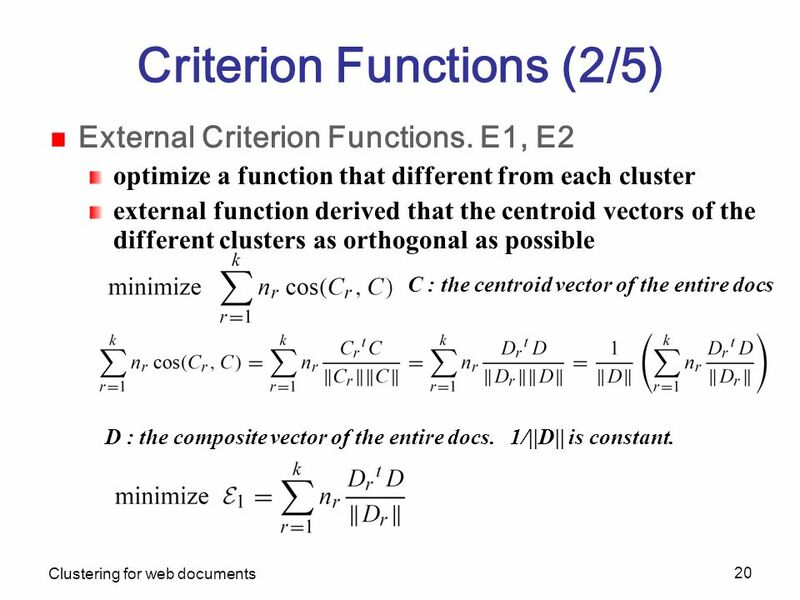 E1, E2 optimize a function that different from each cluster external function derived that the centroid vectors of the different clusters as orthogonal as possible C : the centroid vector of the entire docs D : the composite vector of the entire docs. 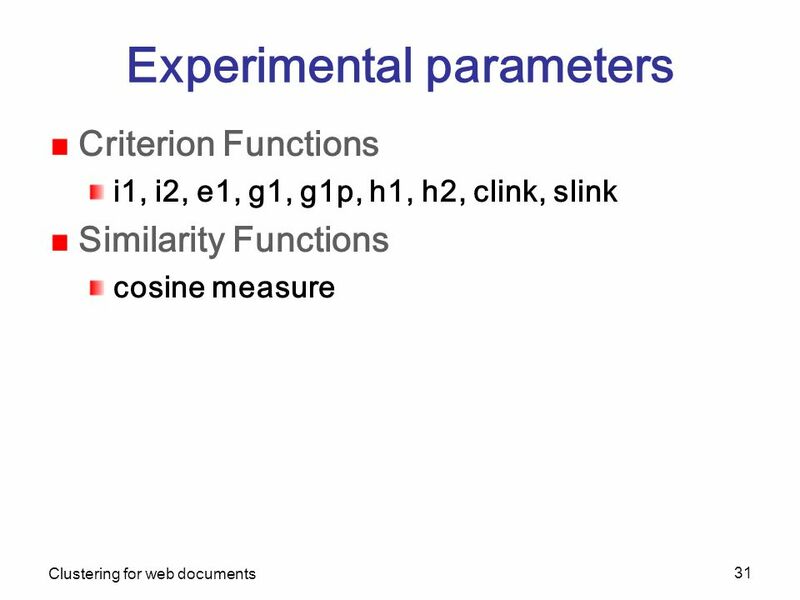 1/||D|| is constant. 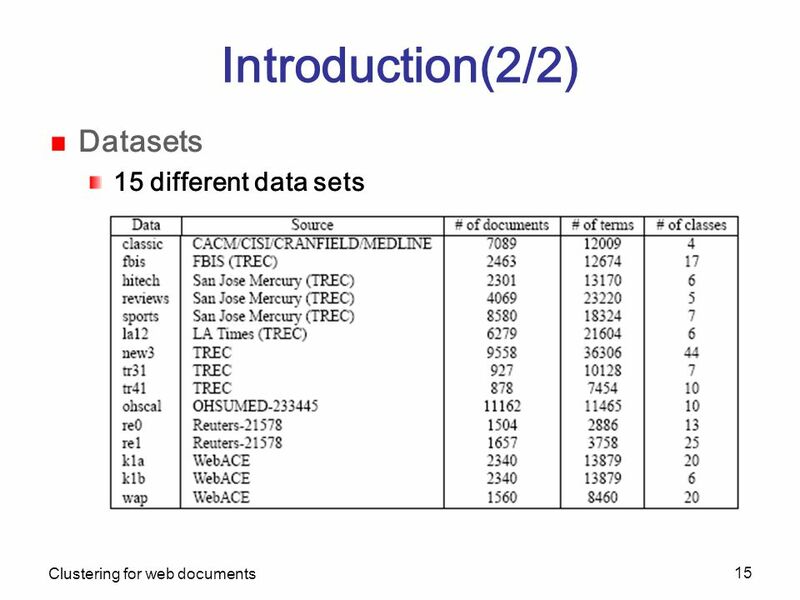 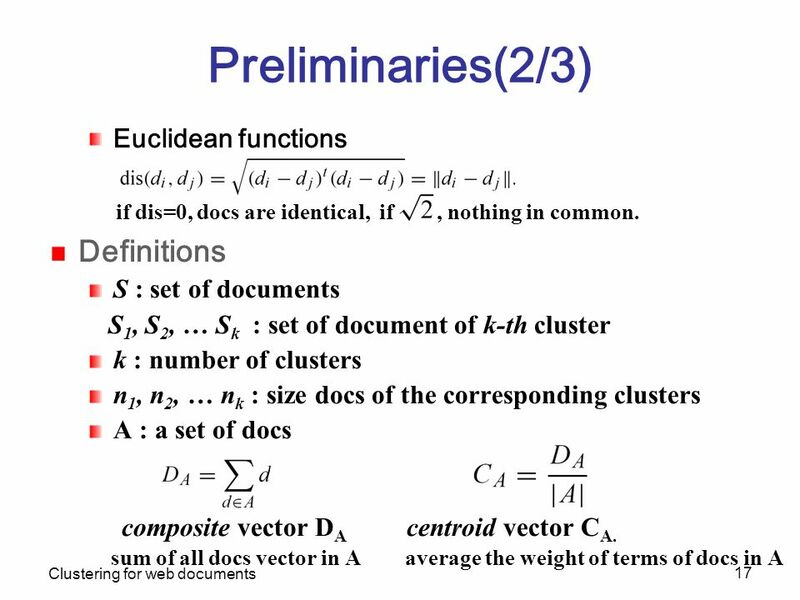 23 Clustering for web documents 23 Criterion Functions (5/5) G1. 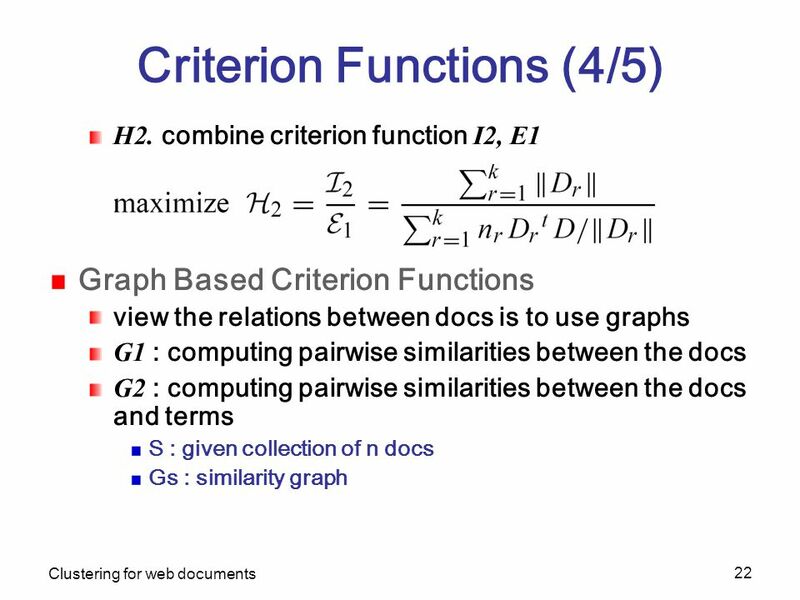 G2. 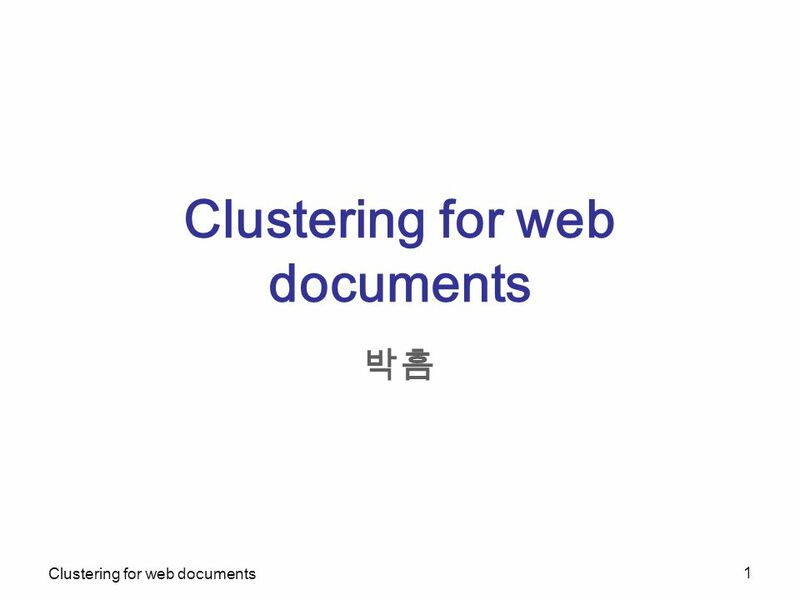 Download ppt "Clustering for web documents 1 박흠. 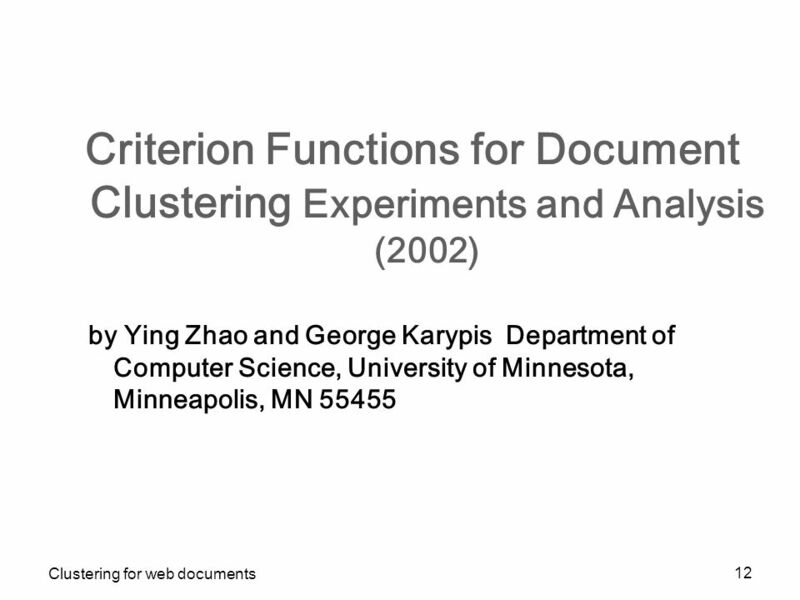 Clustering for web documents 2 Contents Cluto Criterion Functions for Document Clustering* Experiments and Analysis." 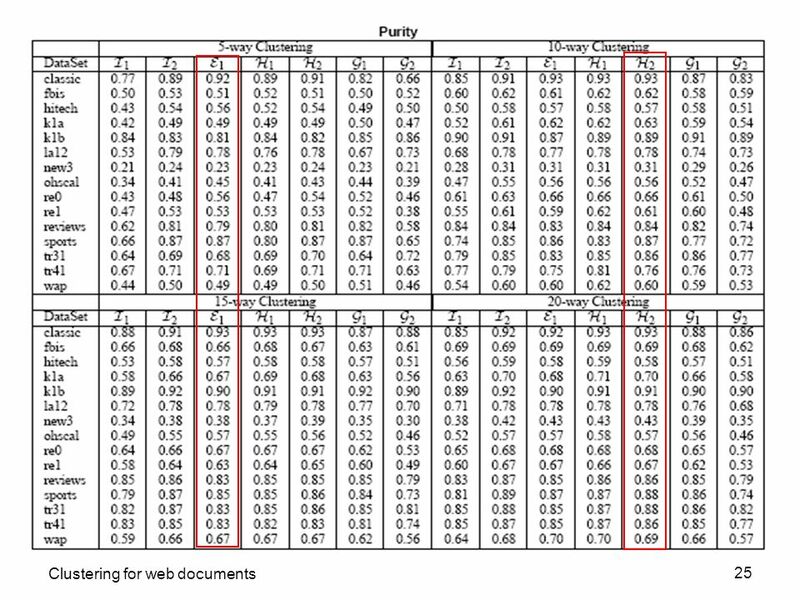 DISCOVERING EVENT EVOLUTION GRAPHS FROM NEWSWIRES Christopher C. Yang and Xiaodong Shi Event Evolution and Event Evolution Graph: We define event evolution. 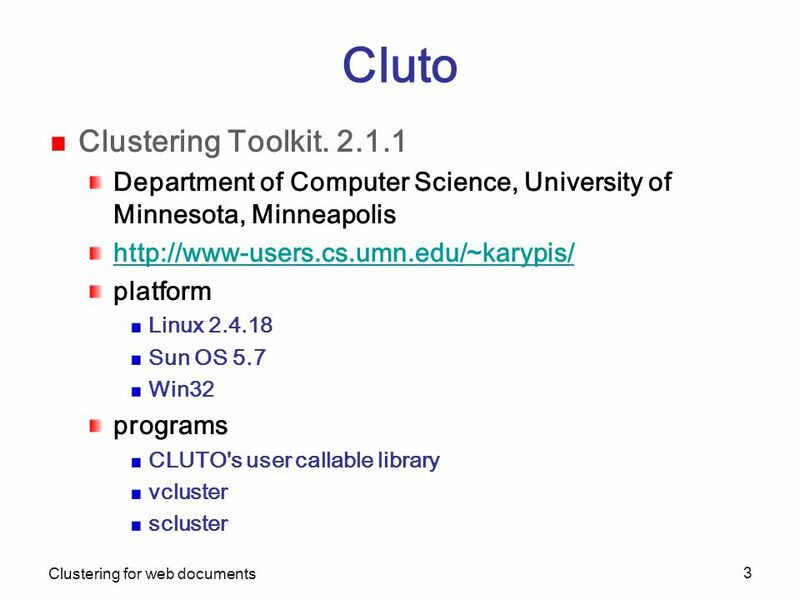 BY ROSELINE ANTAI CLUTO A Clustering Toolkit. 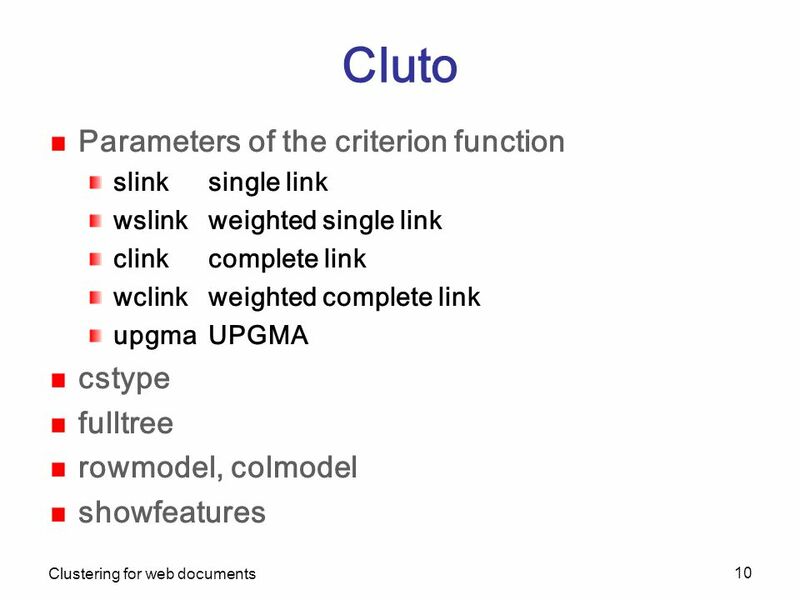 What is CLUTO? 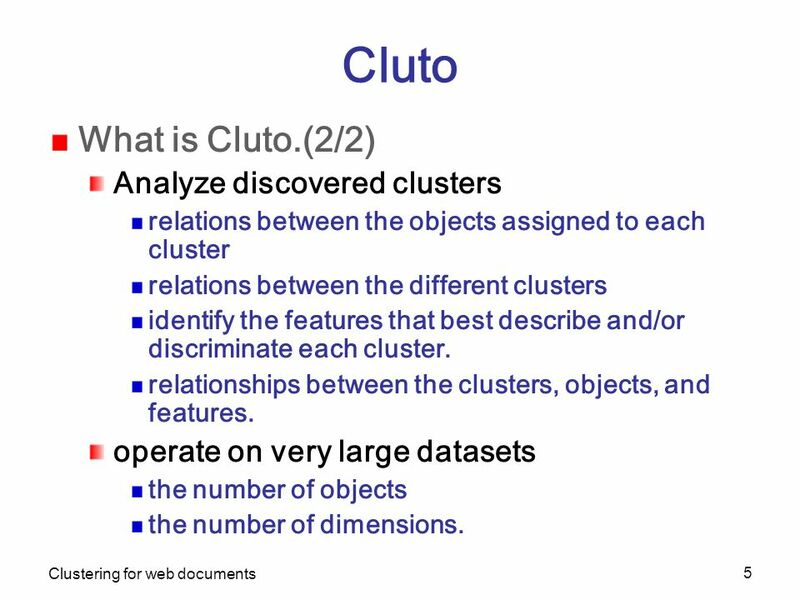 CLUTO is a software package which is used for clustering high dimensional datasets and for. 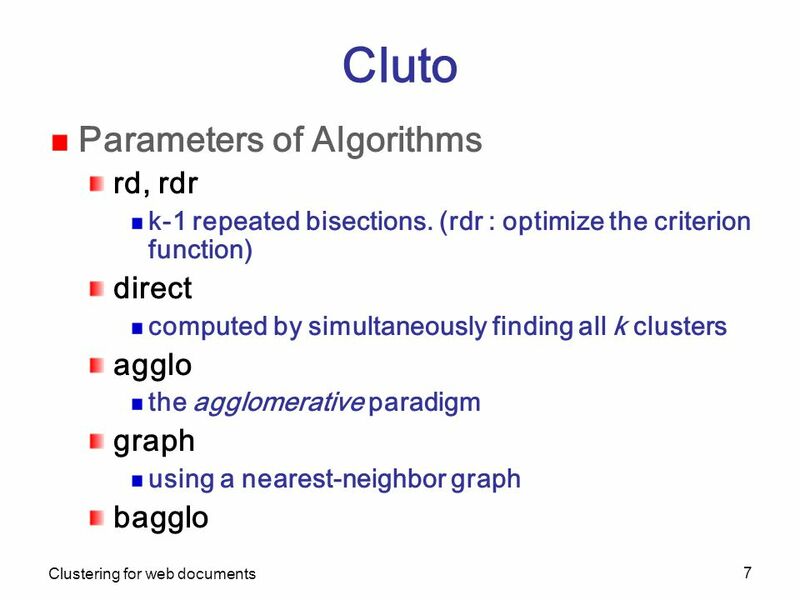 Hierarchical Clustering. 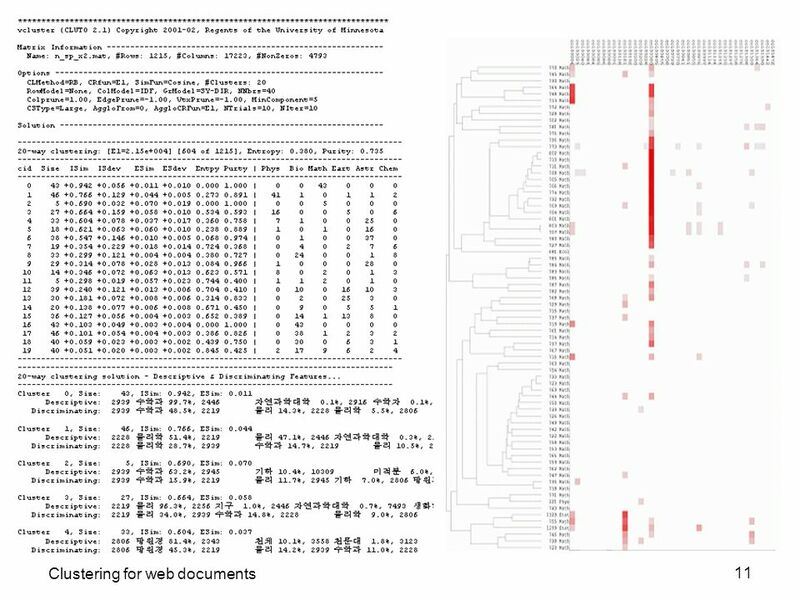 Produces a set of nested clusters organized as a hierarchical tree Can be visualized as a dendrogram – A tree-like diagram that. 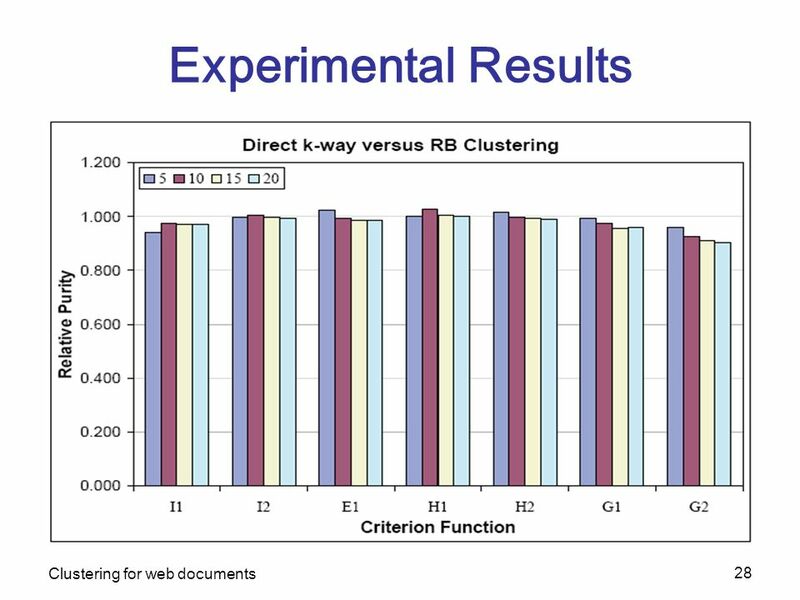 Learning Trajectory Patterns by Clustering: Comparative Evaluation Group D.
The 5th annual UK Workshop on Computational Intelligence London, 5-7 September 2005 Department of Electronic & Electrical Engineering University College. 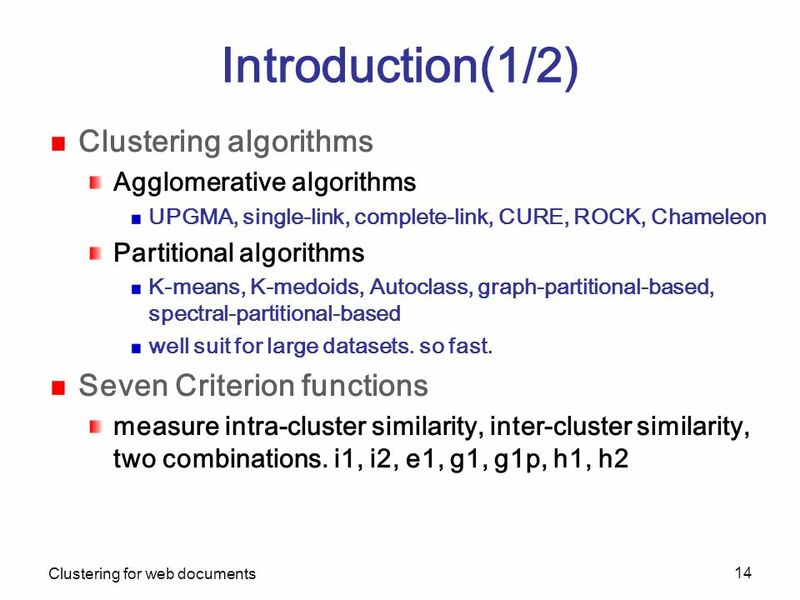 Clustering Paolo Ferragina Dipartimento di Informatica Università di Pisa This is a mix of slides taken from several presentations, plus my touch !